As those of you who've spoken to me on the subject know, my opinion on the Masterpiece line is quite stark. I'll happily agree that there are a lot of really good figures in the line, but I'm also quick to laugh at terrible figures like Megatron or the Seekers, or point out the absurdity of releasing army-builder figures like Sunstorm or Tigertrack at a Masterpiece price point. One of the figures that I did like the look of was Sideswipe, but there was one problem with him. I was born in 1984 and followed Transformers through the late 80s and 90s, so for me Sideswipe is black. I didn't really expect to actually get the option to buy him in his G2 colours, though, because that would just be wacky. But for once Takara's twisted release logic worked in my favour to an extent, because they did indeed make a G2 Sideswipe -- and not only did they do it, but they gave it a new head and accessories based on his appearance in the G2 comics! I spent far too many words going on and on about how much G2 Sideswipe meant to me when I reviewed the original toy, so I'm not going to cover that ground again. Suffice it to say that this figure is an update of one of my childhood favourite Transformer toys, and it has a whole lot to live up to. Alternate Mode: Sideswipe's alternate mode is, in a word, gorgeous. 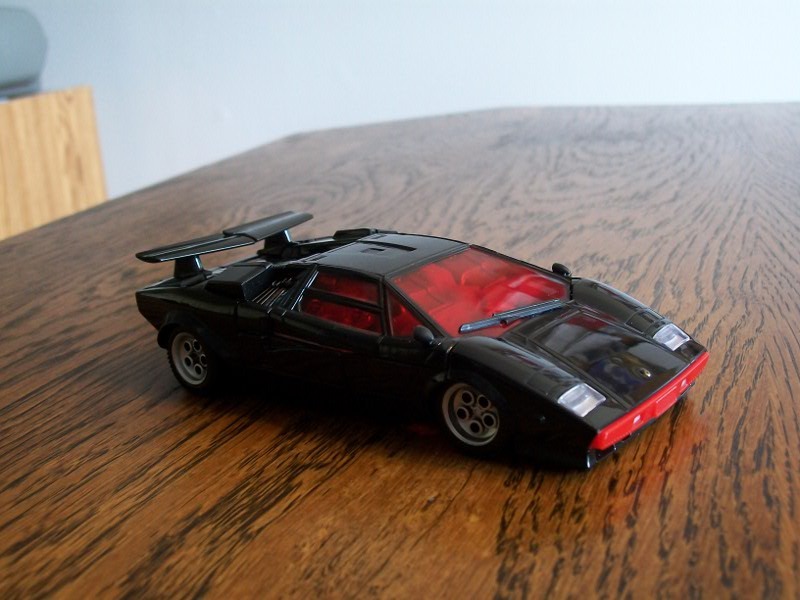 The Lamborghini Countach was always just about the prettiest car in the entire Transformers line, and rendering it at a larger scale only serves to make it stand out more. The red version of the car is the iconic one, not only for Sideswipe but for the car model in general (nearly half of the pics that come up in an image search are red ones). But it is just as luscious in black. The effect is very different, though. In red, this car looks fast and sporty. In black, it looks dangerous. The finish on the car, as you would expect on something labelled "Masterpiece", is amazing. The car is painted black from nose to tail, even in spots where the underlying plastic is probably black as well. And while that sounds like a disastrous recipe for future paint damage that makes the car look like crap, at first glance it seems to be holding up well. The figure is well-designed, and none of the black-painted parts endure the sort of rubbing or scraping during transformation that would make for quick paint-removal (as you see on a lot of kitbashes that give the toy an all-over paint job). And the paint itself seems like it's higher quality than what we're used to on Transformers toys, a thick, glossy coat that reflects like a mirror (look at the alt-mode pics and you'll see what I mean) and matches up with what you'd expect on a car. One of the more questionable features on the MP cars is the ability to attach their weapons in vehicle mode. A lot of alt-mode purists don't like it, and even I have to admit that it's a silly idea, but in Sideswipe's case at least it's quite well implemented. He features a small spring-loaded notch on his roof that can recess when pressed down, allowing you to clip in his weaponry. On the original version of the mold this consisted of a fairly normal-looking rifle and shoulder cannon, and that was silly enough. 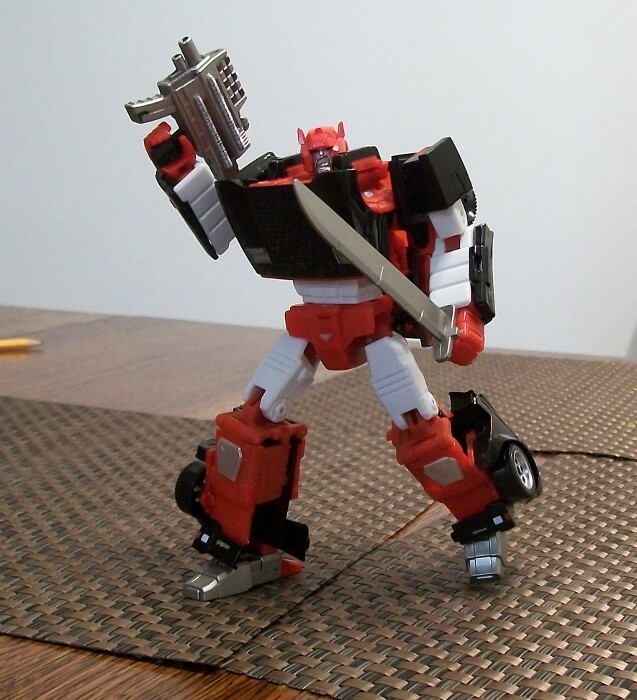 With G2 Sideswipe you're clipping on two huge, 90s-comic submachine guns, a sword and and a pair of spiked wheels, raising the whole thing from "silly" to "transcendentally absurd". And while I was definitely guilty of mounting the original's rifle in alt-mode when I was a kid, I can't imagine anyone buying this toy (which, for those who may not be familiar with the line, most definitely is not for kids) is going to do more than clip the guns on, have a good laugh and then never speak of it again. Rather unusually for a Masterpiece, Sideswipe also came with a sticker sheet. If you're so inclined you can sticker him up like the G2 toy. While a nice touch that will certainly appeal to those who enjoy G2 mostly for the absurdity, there's absolutely zero chance that I'm going to let those tacky things touch this beautiful toy, so I'll have to direct you over to TFWiki.net to see what it looks like. Sideswipe does have a few minor flaws, though. Firstly, though his black bodywork is painted the occasional bits of red that poke out are not. That includes his front bumper and the rear tailpipe assembly, along with a few joints in the rear assembly that don't quite hide all the way. Those parts look fine, but "fine" is a far cry from the excellence of the rest of the toy. In the original deco with the red car body and black bumper/tailpipes you probably wouldn't even notice, but the red plastic is just that little bit less classy than the painted body. Not enough to really detract from the overall look of the car, but enough to be a minor annoyance. 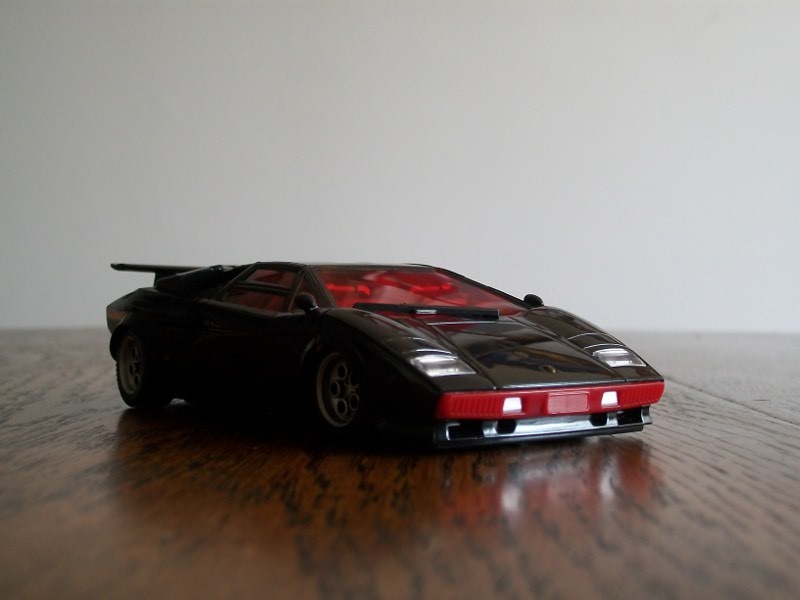 Sideswipe also features red car windows, rather than the original toy's clear ones. While I don't mind (in fact, I think it adds to the Countach's menacing look), it's another something that might get under the skin of car purists. All things considered, though, Sideswipe's vehicle mode is a thing of beauty, fully earning the name "Masterpiece". Robot Mode: Sideswipe's robot mode still features a lot of glossy-painted black, but also quite a lot of white and red plastic. He's actually got surprisingly few paint apps: aside from his head the only robot-exclusive paint I can spot are his silver kneecaps, a silver arrow on his groin and (possibly -- they might actually be molded this colour) his silver feet. But the red, white and black are distributed so evenly that he's anything but boring. And while I worried that the bare plastic would look cheap compared to the black-painted car parts, the final product looks great. One small quibble with the colour layout is that Sideswipe's head is painted red, rather than being red-molded plastic. Because of that it's a slightly different shade and a lot glossier than the rest of his red. Right now you'd only notice if you were looking for it, but as the toy ages if his red plastic fades it's going to become more noticeable. Another small appearance flaw is Sideswipe's shoulders, which aren't actually attached to his chest in any way, shape or form. They're actually connected to his back and windshield assembly, and when you look at him from above or a 45� angle from the front it's very clear that they're just floating off on their own. Functionally they're just fine though, and you shouldn't need to worry about whether or not they'll stay in place when you fiddle with his arms. Sideswipe's robot mode is way bigger than you'd expect looking at the toy's car form. The car is, in fact, barely bigger than a Generations Deluxe-class figure. But it explodes out into a robot that's closer to Voyager-sized. This is because, for the most part, Sideswipe's robot mode is hollow. The transformation is designed well enough that it's hard to tell by looking at him, but as soon as you pick him up you'll realize how light he is. And that lightness makes for a figure that's easy to balance in a wide variety of different poses. As far as articulation goes, Sideswipe really isn't anything special. His neck can swivel 360�, but although it's designed to allow him to look up there's very, very little vertical tilt. He has double-jointed shoulders, elbow hinges and swivels at the bicep and wrist. A waist swivel, double-jointed hips, thigh swivels, a knee hinge and double jointed ankles are his lower-body compliment of joints. Aside from articulated hands there's nothing here that you won't find on an average modern Deluxe figure, and nowhere near the insane range of motion that you see on some of the older "all ball joints" toys. But while Sideswipe's articulation skews closer to average than exceptional, it's still more than adequate to the task. None of the joints have any problematic restrictions (though if you move his legs too far they will push his crotch flap open), making Sideswipe quite good both for play and display. The last thing to cover are Sideswipe's accessories. And in spite of having a bevy of items designed just for him, I can't quite feel like this is his weakest point. 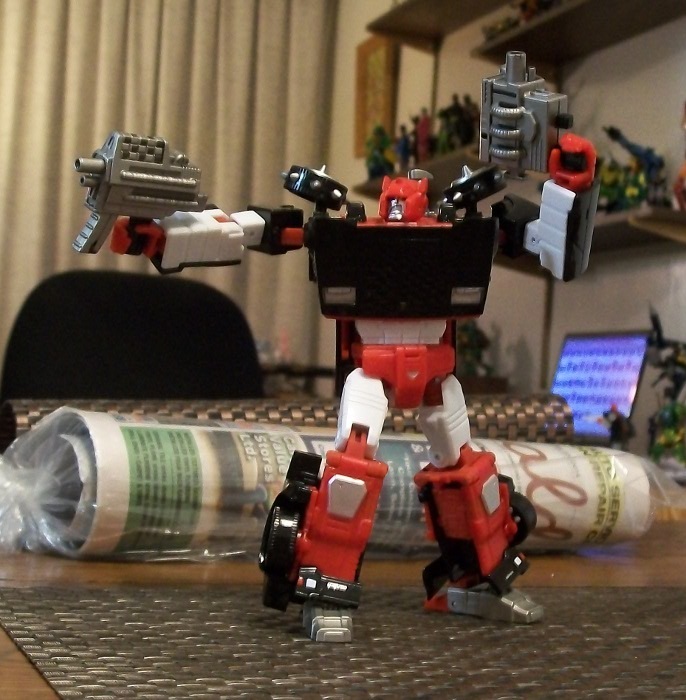 Sideswipe comes with two guns patterned on the ones he wielded in the Generation 2 comic, as well as a sword and his shoulder-wheels from the same source. All of them are very comic-accurate, but (in my opinion obviously) the wheel accessories make him look a bit silly. Meanwhile, the guns are quite nice-looking but Sideswipe can't actually hold them. The studs on the guns' handles will slot into grooves on Sideswipe's hands, but if you try to actually close his hands over them they'll fall out. That leaves the sword as the only accessory that I routinely pose him with, since it's quite cool and he can actually hold it properly. 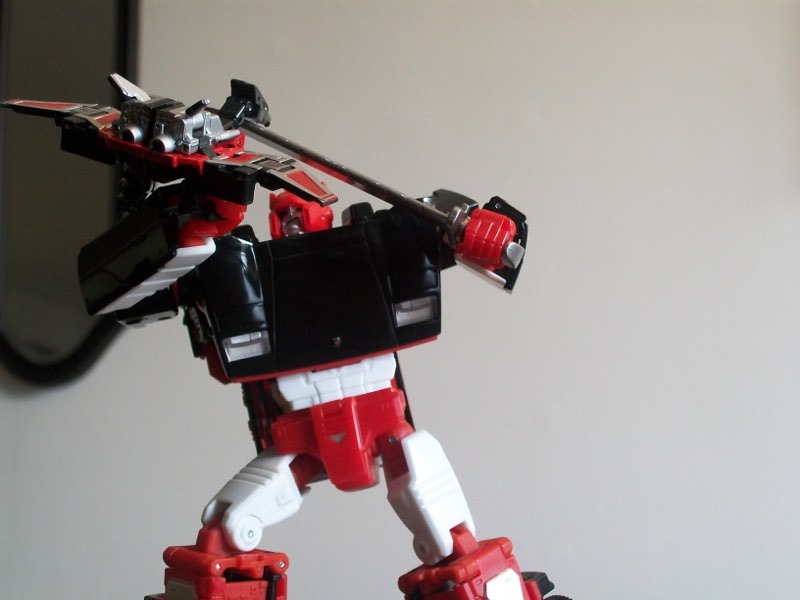 All in all, Sideswipe is both a really fun toy and a really nice shelf piece. Not without flaws, but definitely a good robot bode.